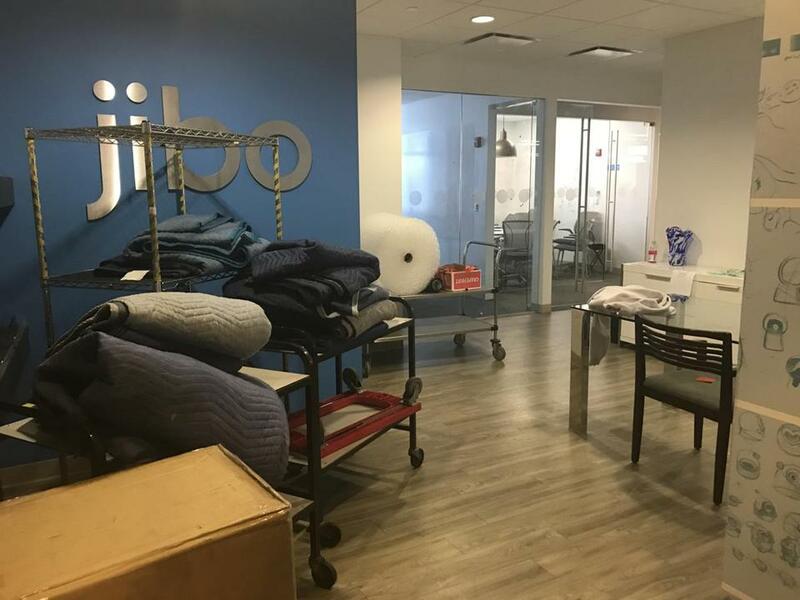 Jibo’s Financial District office was empty on a recent weekday, with packing supplies in evidence and furniture bearing “sold” labels. It’s happening right now at two Boston startups that together have raised more than $160 million in funding from local venture capital firms, and trace their roots to the MIT Media Lab: Jibo and Jana. Jibo is the higher-profile of the two. Founded in 2012 by a MIT robotics professor, Cynthia Breazeal, it set out to design a countertop robot that would serve as a kind of household concierge. The company’s launch video featured a chipper assistant able to serve as a photographer at parties, facilitate videoconferences, and even order Chinese takeout. But the product didn’t hit the market until last fall — and when it did, it couldn’t do many of the things promised in the video. And then there was the price: $900. “A robot is one of the hardest pieces of tech to get out the door,” robotics entrepreneur Gui Cavalcanti said, “because it’s a combination of advanced mechanical, electrical, and computational systems that all have to work together. Jibo wasn’t ready for producing robots at scale quickly, and the lag time killed their relevance in a fast-moving market.” That market is now dominated by less-expensive smart speakers from companies like Amazon, Google, and Apple. Jibo’s vice president of marketing, Nancy Smith, confirmed that the company laid off employees in June, “to allow ourselves additional time to secure additional funding or pursue an exit.” (“Exit” is startup lingo for an acquisition or IPO; the latter is not a realistic option for Jibo). When I dropped by Jibo’s office midday Wednesday to return a loaner robot, no one was visible working inside, and nobody came to the door. Jibo has raised more than $70 million in venture capital funding, much of it from local firms that included Flybridge Capital Partners and CRV. Jana has raised even more money from investors — about $90 million, according to Crunchbase, a startup funding database. It launched a mobile app for Android phones called mCent, which helps defray the cost of mobile phone usage in emerging economies like India and Brazil. How? Users interact with marketing messages or install an app that is being promoted, and they get a few rupees knocked off their monthly bill. But several things took the wind out of Jana’s sails, according to a former employee. The cost of mobile data packages started to drop in the markets that Jana was targeting, and the ad rates that Jana could command were plummeting as well. Plus, Google started rolling out free Wi-Fi access in hundreds of train stations around India. That reduced consumer interest in Jana’s major market. There was also “a revolving door” in Jana’s leadership ranks, says the former employee, who asked for anonymity. The company had about 100 employees at one point, and investors valued it at $300 million, according to the former employee. But in late June, there was a severe round of job cuts, and efforts are underway to either sell the company or reboot it with a different strategy. Nathan Eagle, the CEO and cofounder, didn’t respond to e-mails or phone calls seeking comment. What is typically happening at this point in a startup’s life? “There are a lot of closed-door meetings,” says David Chang, an angel investor and serial entrepreneur who has been part of both successful startups (TripAdvisor) and failures (Mobicious, a photo sharing service for mobile phones.) “The energy changes. The founders aren’t around. When people sense that the ship is sinking, it’s really hard to get them focused.” Board members and investors may be offering conflicting advice about the best course of action, Chang says. The founder is typically trying everything he can “to keep the lights on,” he says. Sometimes, Dipul Patel says, the founders of a startup aren’t aware of how bad things are until it’s too late. “You don’t realize that you’re on death’s doorstep as quickly as you should,” Patel says. “It’s like looking in the mirror one day and realizing that you got fat. Well, it didn’t happen all of a sudden.” In 2016, after several rounds of layoffs, Patel sold his Boston startup Ecovent to a larger company, ConnectM Technology Solutions of Marlborough. There may be a face-saving sale that gives the investors a bit of their money back — but no profit. A bigger company may want to “acqui-hire” the startup’s team of engineers, paying a nominal amount of money to save the larger firm the trouble of recruiting engineers on the open market. Sometimes a venture capital firm forces one of its troubled startups to merge with a healthier startup working in a similar arena. And sometimes, there is manna from heaven — a miraculous new source of funding that comes in at the last possible moment.